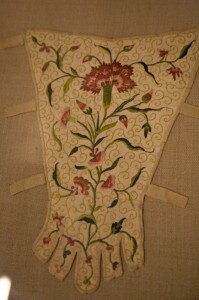 Early on, I had decided that I needed to make a new stomacher to match my 18th century robe a l’anglaise. The original one I had made 12 years ago was completed using quick and easy ribbon embroidery and appliqued lace motifs, mainly so that I could wear it immediately to a ball. But once I found out that the dress no longer fitted me, I decided to make a caraco jacket. 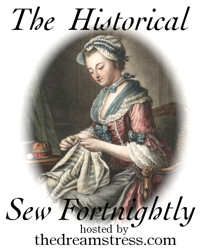 Caraco jackets were worn as day wear in the last half of the eighteenth century. They were styled similarly to a gown but the skirts were trimmed off at mid-thigh level, with a petticoat worn underneath. Some would meet in the middle, fastened with hidden hooks and eyes, but others were worn open and had a decorative stomacher displayed at the front. Since I really like the idea of a pretty piece of handiwork displayed on the bosom, I decided to make another stomacher that would match my new jacket! Stomachers were often worn during the seventeenth and eighteenth centuries, though they did change shape a little throughout the period, depending on the fashion. They were triangular shaped pieces of material, either boned or unboned, usually pinned in place at the front of the bodice. They were often elaborately decorated, using many different methods and items such as embroidery, bows, pleated ruffles, braid, lace or sequins. Using a stomacher pattern in Janet Arnold’s Patterns of Fashion 1 for inspiration, I drew out a pattern on tissue paper and cut out two pieces of calico and one piece of outer fabric. 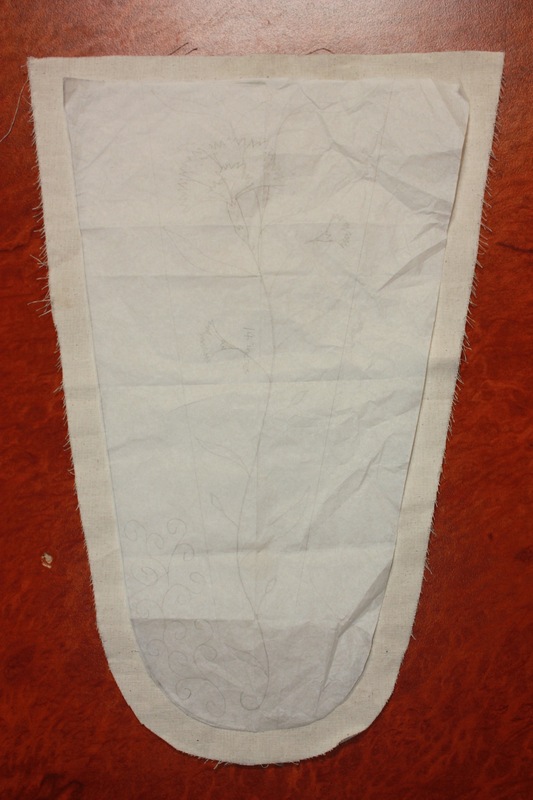 I researched common embroidery patterns for stomachers and drew out a pattern for this on the tissue paper. 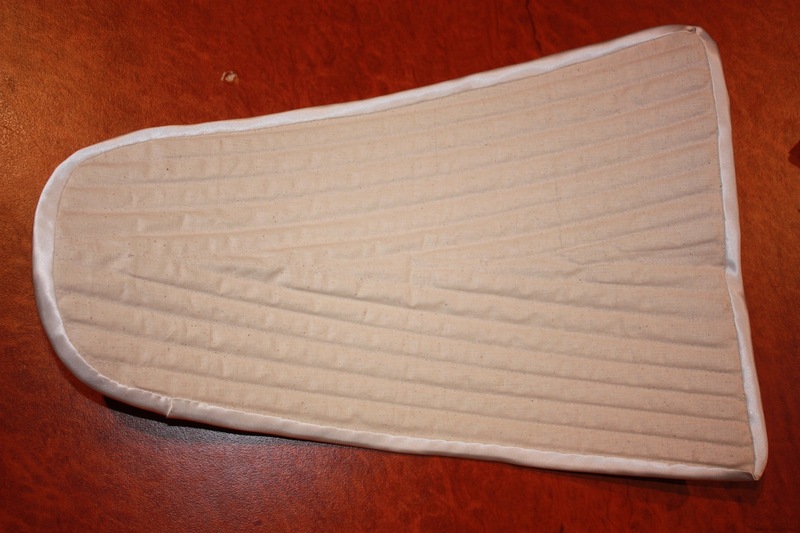 The two layers of calico were placed together and boning channels sewn through all layers. As you can see from the picture, the stomacher is fully boned. Once the embroidered outer layer was completed, it was laid on top of the boned layer and the edges bound with satin bias binding. After a lot of deliberation, I decided to stretch my embroidery skills to long and short stitch, and try embroidering a carnation with some buds in true eighteenth century style! 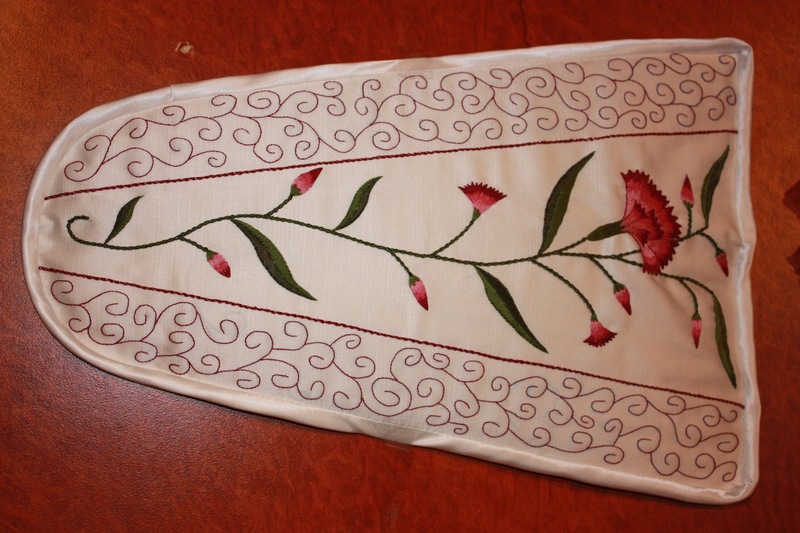 The V-shaped border and the stem of the carnation was done with a whipped chain stitch, and the scrolling curves at the sides were done with backstitch. The leaves were done in a satin stitch, creating a groove where the stitches met in the middle of the leaf. I am VERY VERY pleased with the result! I have never been good at embroidery, but I have spent a lot of time practising with very simple plain stitches to create some good effects on my costumes. I never thought I would be able to do this so well! Now all that remains is to finish off my caraco jacket! Hello Tea Cup Lady! The finished product looks fantastic….your embroidery is such a fine piece. It will perfectly compliment your jacket! Well done!! Thank you. I am very chuffed with meself! That is so beautiful, I am inspired to embroider one of my own! Oh, I would love to see pictures of what you come up with! Excellent! Your stomacher is divine! I too have a hand embroidered stomacher that I have had for a number of years. The gown it was worn with is gone, but I have yards of yummy soft, pale seafoam-bluegreen wool, and am trying to find someone to make me the 18thc. jacket—(I am making the petticoat), so that I can wear it again! You certainly deserve to be “chuffed” with yourself—You “done yerself proud, ma’am”! Your blue-green wool sounds lovely! Just the thing! Now I look at it, I remember seeing your stomacher when I was searching for ideas as to what to embroider. It will go wonderfully with your jacket! that looks amazing, Kel! brilliant job!……photoshoot time? Yes! Desperate for a photoshoot Bec! Need to find a time and place! That is beautiful Kelly! Love your work and attention to detail! Would love to see the finished jacket! Thanks, Rochelle. The jacket is almost done, with just the hemming, fasteners and trims to go. I am looking forward to trying it all on together! 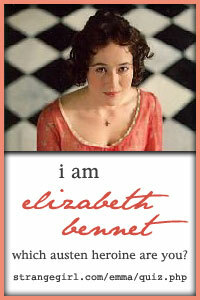 I’ve come across your blog while researching the clothes for my 18th Century Annapolis heroine. I loved seeing how you made yours. Love the embroidery. Thank you! This piece of embroidery is my favourite of all that I have done so far. I would like to do another one at some stage.